Lam Dong (VNA) – A total 179 Vallet scholarships worth nearly 2 billion VND (about 85,920 USD) have been presented to disadvantaged students in the Central Highlands and the south central provinces of Ninh Thuan and Khanh Hoa. A ceremony to hand over the scholarships was held in Da Lat city of Lam Dong province on September 3. The Vallet Scholarship Fund was established in 2001 by Professor Odon Vallet from France's Sorbonne University through the Meeting Vietnam organisation. This time, 25 scholarships each worth 17 million VND were given to students of the Universities of Da Lat, Nha Trang and Tay Nguyen. Meanwhile, the remaining scholarships worth 10 million each were presented to high school students in the Central Highlands provinces of Dak Lak, Dak Nong, Gia Lai, Kon Tum, and Lam Dong, and south central Khanh Hoa and Ninh Thuan provinces. 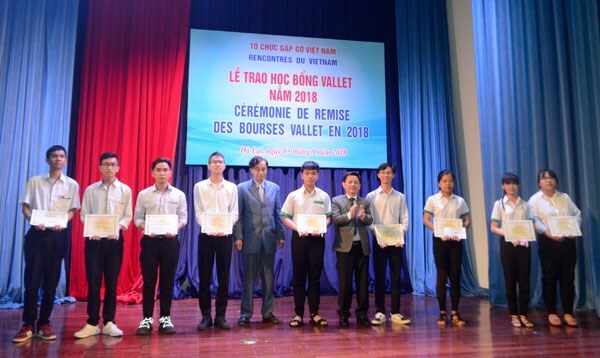 In August, 144 Vallet scholarships worth 1.4 billion VND (60,200 USD) were also presented to outstanding students and young researchers in the central province of Nghe An. Since the beginning of 2018, the fund has presented 3,200 scholarships worth 25 billion VND (1.07 million USD) to Vietnamese students. Over the past 17 years, Professor Vallet has spent nearly 230 billion VND (9.89 million USD) on more than 34,000 scholarships for students and young Vietnamese researchers.